Continuing to impress in their two decades of existence, Blut Aus Nord's third part of the Memoria Vetusta series (after 1996's Fathers of the Icy Age and 2009's Dialogue With the Stars) may not just be the best of the trio, but the best album they've released in a decade. Rare is the band that can continuously reinvent itself, and although Blut Aus Nord drove their industrial sound into a repetitive rut, they've shown signs of transcending it, such as earlier this year in the Triunity split. I hope that Saturnian Poetry is the start of something truly new, and that the band won't return to their prior path afterwards, as despite being more traditional in its black metal approach, it's a fantastic album. Taking their now signature eerie dissonance back to the early nineties, this is an album rich with atmosphere, from Necrolord's beautiful artwork to intro Prelude, keyboard ambience that has the mystical effect of such pieces from the nineties whilst sounding like something of now. As I mentioned in the Triunity review, the addition of a human drummer is one of the best decisions that the band have made in years. His technical and varied contribution (the band are, as ever, mysterious, so who knows if it even is a 'he') is a vital part of a complex sound, rich and multi-faceted, where guitars, bass, and keyboards make something truly beautiful. It's not so much a torrent of intense fury as a near-orchestral swelling, a kaleidoscope of sound that often begins with traditional blasts but opens into something more epic and wonderful. Paien, the first track after the intro, could have come from the band's first Memoria Vetusta album if you just listen to the first minute or so. After that, it twists and turns, introducing clean vocals, twisting the riffs back on themselves, building majestically with some beautifully subtle background keyboards and allowing Vindval's croaky vocals their full impact. It's as hypnotic and gripping as the best black metal should be, reminding me more of In The Nightside Eclipse than the Blut Aus Nord that we're used to. Tellus Mater continues this style, the frequent, almost warlike drum beats shifting the focus towards something more akin to early Abigor, and Forhist introduces more dissonance and complexity to the structure, riffs curving back on themselves and blending together in a manner much like the band's industrial material – albeit with the industrial elements stripped away and replaced with (limited) clean vocals, the overall atmosphere less dark but equally effective. 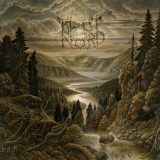 There's even a pagan metal vibe to some of the riffs towards the end, Blut Aus Nord looking to the past for influence rather than the future. Where Saturnian Poetry stumbles a little is in the songwriting – on the surface, it's terrific, but the album as a whole feels slightly repetitive if you listen to it a lot, despite the individual songs being well-constructed and effective. This comes to the fore on Henosis, a track that feels like it was manufactured from parts of others. Still, the album finishes very strongly with a pair of excellent tracks; Metaphor of the Moon, which ramps up the tension and drama, and Clarissima Mundi Lumina, which is where the threads truly coalesce as the clean and harsh vocals gel perfectly atop an epic culmination, something like Immortal reconstructed and focused as never before. It's what I've been wanting to hear from Blut Aus Nord for years, and although Saturnian Poetry has faults, it's the best album the band have produced since The Work Which Transforms God, and is fully recommended for those who like their black metal atmospheric.